North Yorkshire is England’s largest county and one of the most rural comprising of the Yorkshire Dales, North York Moors, Vale of York and the coastal regions and they all have their own distinctive natural beauty. The county covers an area of 3,341 square miles and 40% of this area is covered by National Parks and with stunning moorland, beautiful dramatic to rolling hills, ancient woodland, a spectacular coastline, splendid waterfalls, many attractive villages and hamlets and many historic sites such as abbeys, castles, priories, stately homes and traditional pubs there is something for everyone of all ages to explore. The North York Moors has one of the largest expanses of heather moorland and it became a National Park in 1952 and covers an area of 554 square miles stretching from the Derwent Valley to the Cleveland Hills just south of the Tees. The sandstone and limestone hills have formed a rugged landscape with wide heather clad moorlands on the open tops and pretty farming communities and villages in the many sheltered valleys many of them hidden away. To the north and west the moors are defined by the steep scarp slopes of the Cleveland Hills on the edge of the Tees lowlands to the east the moors are clearly defined by the impressive cliffs of the North Sea coast and to the south by the broken line of the Tabular Hills and the Vale of Pickering. Please note the Moorsbus Network (mentioned in some of our other Moors walks) operating on Sundays and Bank Holiday Mondays from 1st April to 28th October, a great way of exploring the North York Moors instead of using your car, has been refused funding from NPA and it is not yet known whether the service will continue in 2014 or the future. Rosedale is a stunning valley located almost in the centre of the North York Moors National Park and is surrounded by some of the most beautiful moorland and Blakey Ridge at 400 metres sitting to the northwest is home to the Lion Inn which is one of the most remote pubs in the country and is very popular with music fans that flock there to hear some of the best local and national bands. The River Seven flows south through the valley from its source at the head of the dale on Danby High Moor. The river flows for 15 miles passing Rosedale Abbey and a number of villages on its lower course where it meanders due to interlocking spurs before joining the River Rye at Little Habton near Malton. Rosedale narrows at the southern end between Spaunton Moor and Hartoft Rigg, here the river flows out through Forestry Commission woodland before passing the village of Cropton to reach the plains of the Vale of Pickering. The early settlements, some dating from the 12th century or earlier, depended on the river and fertile land in its flood plains for fishing, washing and farming. Today there are only a few working farms left and the majority of homes are bought as second homes. Iron ore has been processed on the North York Moors since Medieval times but in the late 19th century high grade magnetic ironstone was discovered in Rosedale. The valley became a major centre for iron ore extraction which led to a population expansion and also the building of what is now the only village, Rosedale Abbey, built round the site of a former Cistercian Priory. The mines closed in 1925 due to the falling price in the value of iron and increased costs but operations continued for a few years extracting the valuable calcine dust from the slag heaps. 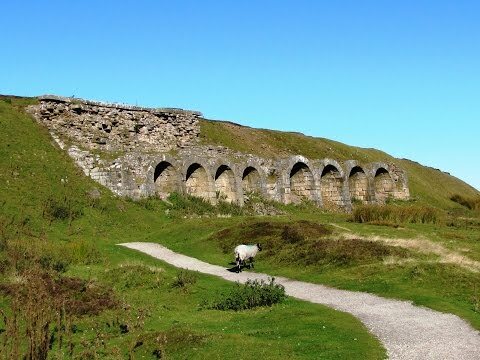 The East Mines at Rosedale East and also the original kilns of Bank Top at Rosedale West are still visible but the nearby engine shed at Bank Top was dismantled and the stone used for the building of the village hall at Hutton-le-Hole just further down the valley. The Rosedale Branch, an 11 mile standard-gauge railway line, opened in 1861. The line ran round the head of the valley serving the iron ore mine workings on either side and ran across the North York Moors to reach what is now the Esk Valley Line at Battersby Junction. The line closed in 1929 and the dismantled track now provides a walk with superb views. Rosedale Abbey is an attractive village set in the centre of the stunning rolling hillsides of the valley of Rosedale, midway between Pickering and Castleton, in the heart of the North York Moors National Park. Kirkbymoorside is the nearest town about 7 miles to the south. Rosedale abbey with stone built houses and a village green consists of a church, an art gallery, a glass studio, a tea room, licensed coffee shop come bistro and take-away, two pubs and a caravan and camping park. Rosedale Abbey which once had a Cistercian Priory of the same name was founded in 1158 and was inhabited by a small group of nuns who were the first people to farm sheep commercially in the area. The priory ceased to operate in 1535 due to Henry VIII’s Dissolution of the Monasteries and was dismantled in the 19th century and all that is left today is a staircase, a sundial and a single stone pillar. The stone was reclaimed for building including a new church on the site of the original priory. Rosedale show held in the village in mid August is a very popular event dating back to 1871 and is one of the oldest in North Yorkshire. Tourism is the main industry now with many of the smaller properties renovated for private holiday homes or as self catering accommodation and the larger properties and farms are taking guests in bed and breakfast accommodation. The Abbey Trail is a long distance footpath with superb views linking seven wonderful historical abbeys including Rosedale, Whitby, Lastingham, Byland, Kirkham, Fountains and Rievaulx. The adjacent Farndale Valley is famous for its wild daffodils around Easter time. We turn right out of the car park and head forwards to the cross roads and cross straight over. We head forwards past the little green on our left and the church (the site of the old abbey) on our right. We turn right just past the school and right again to the back of the church where we take the footpath opposite. We come out into a caravan park and after crossing the track we bear right past the bin collection point towards the river and the corner of the field. We cross over a bridge and up some steps to go through a gate. We head forwards slightly right on the trod path over the field to the road. We turn right and follow the road for about 10 minutes then take the footpath signposted Thorgill on the left. We turn right through the next gate across the field following the yellow arrows. At the next gate we head forwards with the wall on our right. At Thorgill we pick up the tarmac road again and head forwards. The road soon becomes a track. We ignore the footpaths going off to the left and right and keep following the track. When we reach a large house and buildings in front of us we bear to the right through the trees keeping to the track. Immediately after passing between two stone pillars we bear right downhill slightly. We go through a gate and follow the track through the fields with the fence on our left to meet another track. We turn left here to Moorlands Farm. We keep bearing right past Hollin Bush Farm and at the sign post we turn right and head downhill to the river at the bottom, cross over, then head uphill towards Dale Head Farm and Tea Gardens we can see in front of us. At the road we turn left to the farm then right at the footpath signposted Fryup Dale and follow the path round the side of the large shed with a stream on our right uphill. We keep heading uphill quite steeply now on a rutted track until we come to the top. At the top we turn right and go through the gate and head forwards to meet the old dismantled railway line. We follow the higher track (optional) above the railway line along the bank through East Mines. At the end we drop back down onto the railway line and go through the gate and pass a farm on our right downhill to the road. We cross straight over and follow the track, go through a gate just past Hill Houses and turn right downhill. At the next gate we turn right and follow the path through the field. We cross over a little footbridge and bear slightly left following an old trod path then turn right just before the next footbridge. We now follow the river on our right through the fields. We go through a gate then up some steps following the yellow arrows. We pass a bridge on our right and keep heading forwards through the fields until we arrive back at the caravan site. We turn left and head forwards along the tarmac track and make our way back into Rosedale Abbey and the car park. This is an easy to moderate walk on mainly tracks and quiet dead end roads with one steep incline to the old railway line. Elevation: Approx lowest point 135.3m (444ft) approx highest point 293m (961ft). Approx 7.75 miles allow 3 hours using OS Explorer map OL26 North York Moors, Western Area. Start Point: Car park at the back of the Milburn Arms in Rosedale Abbey. Rosedale Abbey, Rosedale in the North York Moors, North Yorkshire. From the A1(M) take the A61 or A168 eastwards to Thirsk. At Thirsk take the A170 passing through Helmsley and just after Kirkbymoorside take the left turn signposted Hutton-le-Hole. After passing the Crown pub take the next right then next left and follow road over Bank Top and down into Rosedale Abbey. Parking: Car park at the back of the Milburn Arms, a small car park near the public toilets and also some road side parking. All are free parking. There are public toilets in the village and for refreshments there is a shop, tea room, Graze on the Green licensed Coffee Shop and two pubs the Coach House and the White Horse Farm Inn. The Milburn Arms has at the moment closed down (2013). There is also the Farmhouse Fodder Tea Gardens at Dale Head Farm.